Local Interest pages on the Monikie, Scotland Website. Some pages of MONIKIE LOCAL INTEREST . .
. . on this website for the area (formerly the Parish) of Monikie, situated in Angus, Scotland. The two major villages of the area are Monikie and Newbigging. The Links on this page will take you to other sections of this site, or better still, try the site search engine. Many pages have photographs and most have links to other pages and more information. The following facility allows you to plan your journey throughout Scotland, courtesy of Traveline, Scotland. For history interest you are advised to look at this site, http://www.old-maps.co.uk/index.htm, for Ordnance Survey maps around 1860 -1890 for (nearly) all of the U.K. - I can highly recommend it. 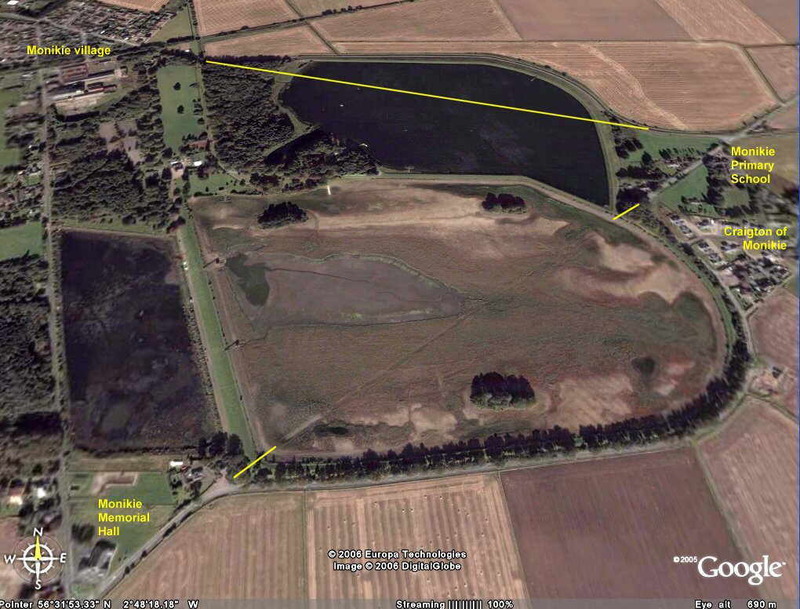 For reference purposes, an extract for the local area of Monikie Ponds (note - no railway) from the above source can be seen HERE and should be compared with a view courtesy of Google Earth which can be seen HERE (with slight colour enhancement and added information). At the date the Google photograph was taken (c.2004) the Island (or South) Pond was drained for maintenance purposes. The line of the old road which was flooded can be clearly seen from this aerial shot crossing the pond. 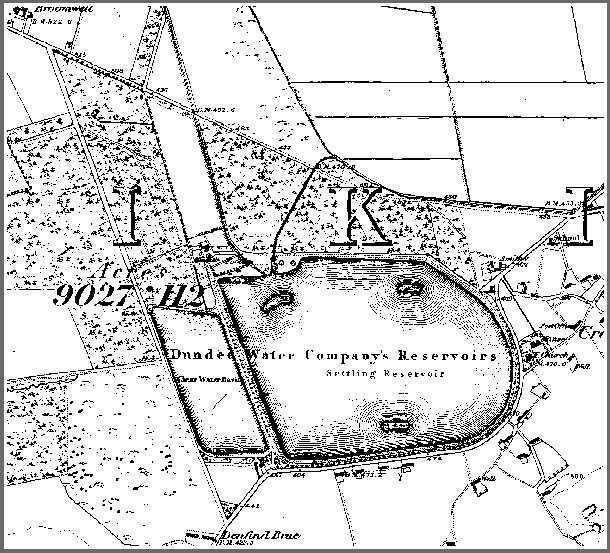 The North Pond also covers an old road and this can be clearly seen on the 1800's map. If you can visit the cafe in Monikie Country Park there is (was?) a very large, dirty map/drawing of the enlarged site before the reservoirs were constructed. Some historic information about this castle, situated on the western edge of Monikie Village. The same page as above, but in French ! - Bonjour! Bienvenue! A detailed, physical description of Affleck Castle, including floor plans. And some more of the Castle and Smithfield, from the Lamb Collection at Wellgate Library, Dundee. Some information about this very ruinous building - can you supply more? A 1954 shot above Craigton of Monikie. A bird's eye view of Monikie Village, and the area around. called - 'The Monikie Story'. .. and the fore-runner to 'The Monikie Story', the Statistical Accounts of Scotland for the Parish of Monikie, for the years 1791/99 and 1842. Read of a large, detailed list of the inscriptions from the older gravestones in Monikie Kirkyard, some photographs, too. "JOURNEY DOWN THE AGES THROUGH THE MONIKIE PARISH". A special "JOURNEY DOWN THE AGES THROUGH THE MONIKIE PARISH" - 800 years. More "JOURNEY DOWN THE AGES THROUGH THE MONIKIE PARISH". The grounds and ponds of the former reservoir are now a popular recreational facility for many. Woodhill Inn, formerly situated on the Dundee to Arbroath Road. 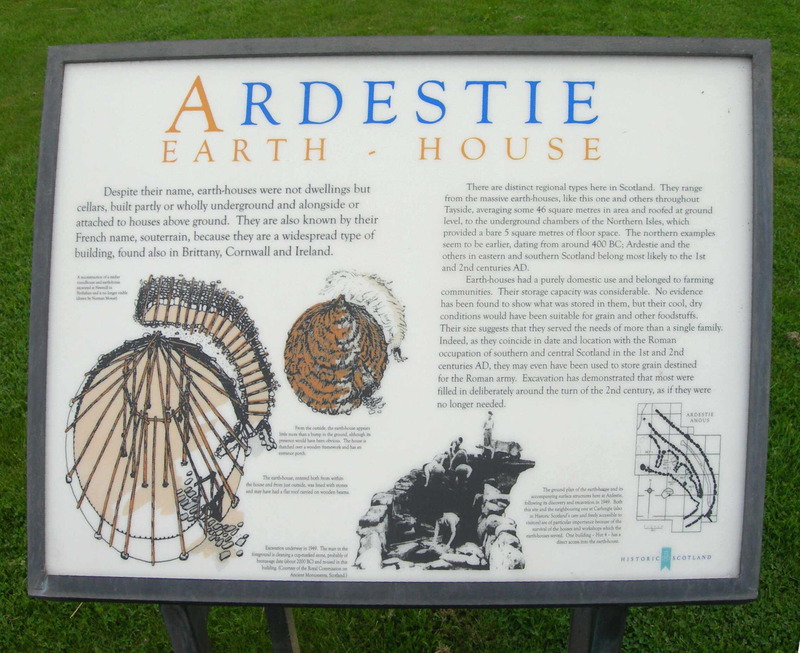 Ardestie Souterrain (or Earth House) is near Monikie. Searching Google will bring you lots of information but possibly not the onsite information signboard which appears HERE. Historic Scotland have compiled details of Listed Buildings in Scotland, the local ones can be seen HERE. A descriptive poem written of Monikie in his very special way by . . . Some specially prepared views of . . MURDER!! in Monikie - read about it. The Panmure Estate forms a major organisation in this area. In the grounds of the estate are the Panmure Testimonial. The ancient Camus Cross, also situated within the estate. Montague Bridge, an interesting structure which spans the Monikie Burn. Look here for a 'postcard' and a little about the former Panmure House. Read of the history of the estate and further information regarding the above subjects...and more! Read some extracts from old books about the Monikie Parish, its farms, its families, Panmure Estate and Affleck Castle, etc. You may not be familiar with the Statistical Accounts for Scotland (1799 and 1845); these are now available on-line at http://edina.ed.ac.uk/statacc from Edinburgh University. A valuable resource and interesting reading if you have the patience to wait for each new page to load.
. . . and, in case you missed it earlier . 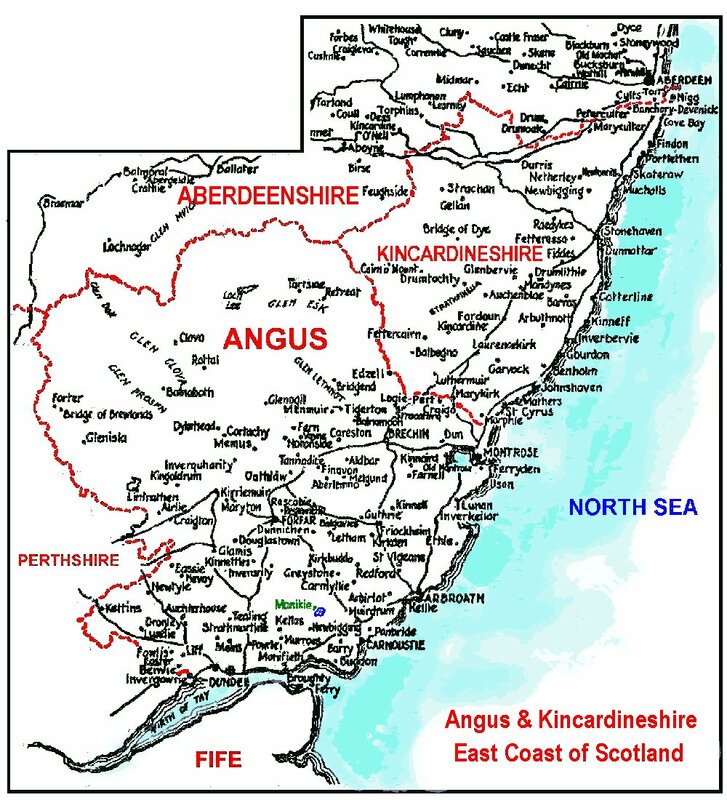 . .
To help you find your way around this area here is a large map (326k) of Angus and Kincardineshire showing Parish and some place names. Of course, you can get the full benefit of the information on this website if you use the Site Search Engine. More photographs and information will be added in time - please visit again soon. Can YOU add to this information?